Why is this configuration important to me? Group Policy Objects (GPO) is a set of rules for Users and Computers, thus the policies for computers will be applied to computers and the policies for users will be applied to users. This article applies to Windows Server scenarios. In OU-TSSERVERS units, there are computer accounts, and in the OU-SUPPORT units there are users accounts. When a user belonging to OU-SUPPORT logs on a server that belongs to the OU-TSSERVER, what happens? Computer Configuration -> The configuration created in GPO linked to OU-TSSERVER. User Configuration -> The configuration created in GPO linked to OU-SUPPORT. Now we are finally going to learn about User Group Policy Loopback Processing Mode. When configuring the policy Loopback Processing Mode, you can choose two different options, Replace and Merge. When you define the "User Group Loopback processing Mode", to "Replace" on the GPO linked to the OU-TSSERVER. When you define the "User Group Loopback processing Mode", to "Merge" on the GPO linked to the OU-TSSERVER. User Configuration -> The configuration created in GPO linked to OU-TSSERVER. NOTE: In case of conflict, the users policies from OU-TSSERVERS have precedence. Because the computer's GPOs are processed after the user's GPOs, they have precedence if any of the settings conflict. Use this configuration if you have users in your domain whose folders are redirected through policy, but you don’t want that redirect to occur when users log on through Terminal Services. 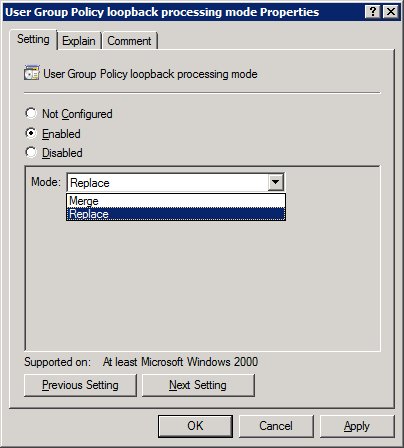 You need to enable this policy setting using the Replace mode on GPO linked to OU, where the Terminal Server's computer accounts are (without folder redirection enabled). When users log on to Terminal Servers, the policy folder redirection is not applied. Then select the appropriate option (Replace or Merge).